Joe Coyle began making stained glass windows in 1986 and went on to train the team of craftsmen and women employed at Alpha today. Our combined experience in church, domestic and commercial stained glass processes ensures the best quality for our customers. From our initial free consultation to installation, we work with the client in creating something completely individual to complement their home. Our designers will liaise with clients and produce original artwork to their specifications. Stained glass panels are then crafted using the centuries-old techniques which have proven to stand the test of time. 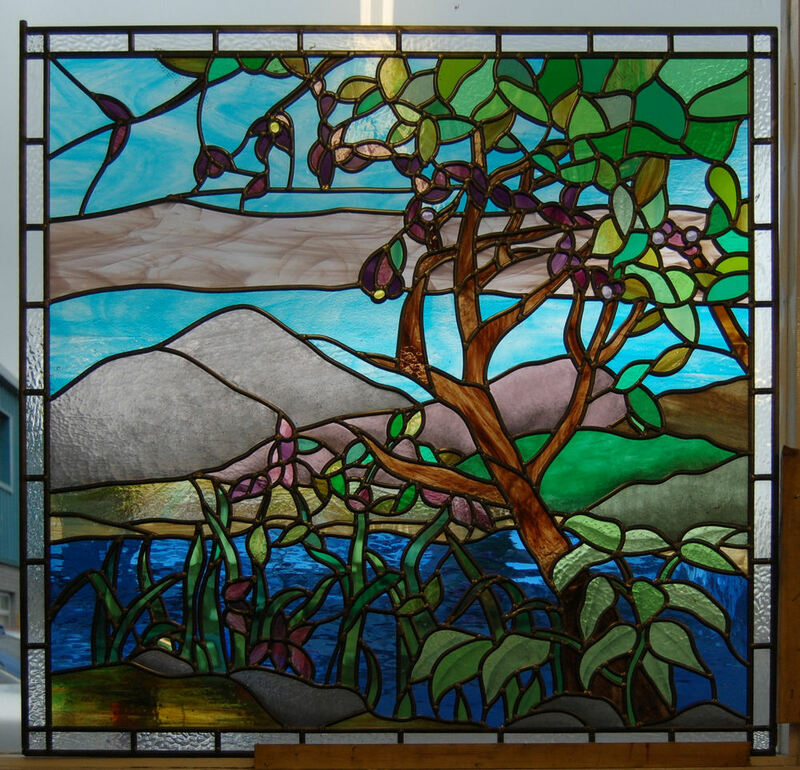 The stained glass panel is watertight and secure as it is puttied and sealed into its frame. However, we also provide a double-glazing service, which will cut down on cleaning and maintenance as well as increasing your energy rating. 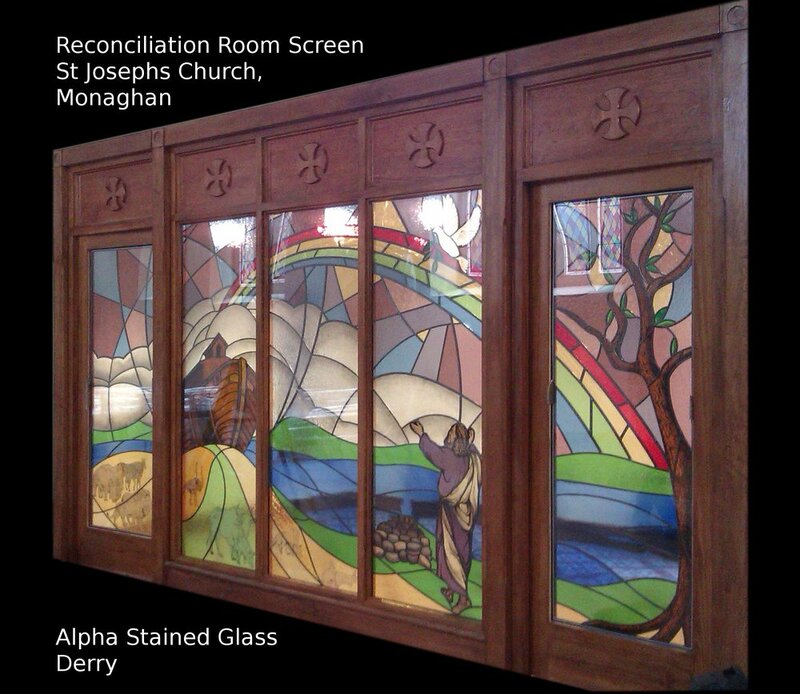 We take great pride in the stained glass windows we have produced and restored in churches all over Ireland. Our team are highly skilled in the restoration of old stained glass windows and have recently had the privilege of working on world class pieces from the studios of Harry Clarke and Meyers of Munich. We have recently completed extensive works at St. Joseph’s, Monaghan and are looking forward to working on the church of Our Lady, Star of the Sea in Bundoran over the next two years. Staff at Alpha have many years experience in creating stained glass pieces for both traditional and more contemporary style bars, clubs and restaurants. Recent commissions include the Bentley bar and restaurant (Derry), the Quays bar (Portrush), the Market bar (Drumore) and Quinn’s bar (Newcastle). As well as stained glass we regularly produce vintage style mirrors (Powers and Guinness) and decorative sandblasting.